What are the different views in Tasks? If you go to the Tasks section of a project, you will notice that there is a Simple, Table, Progress board and Gantt charts dropdown. The Simple view gives you a more general overview of the tasks. You can see if there’s a description, to whom it has been assigned, the due date, if there are any comments or files uploaded etc. 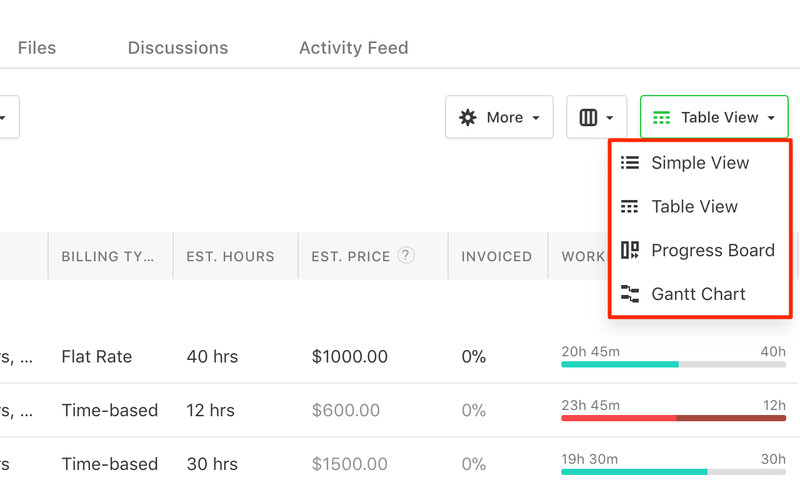 In the Table view you can get detailed information about the task by selecting which columns to display like task creator, billing type, estimated time budget or the actual progress. The Progress board is a Kanban style board that allows you to get a more visual overview of the tasks that either need to get done, are in progress or complete. You can add new columns if you wish to, or change the name of existing ones. The Gantt chart view allows you to have a calendar view of your tasks, task lists and milestones. Tasks are displayed based on their start and end dates, while milestones are displayed based on the set due date. You can set dependencies between different tasks and also between tasks and milestones.